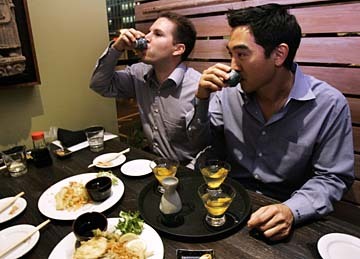 Owner Kevin Aoki, above right, and manager Russell Merdjanian drink up at Doraku Sushi. Wine drinkers aren't the only ones having fun with tastings these days. For the longest time, this activity was reserved for wine snobs. Don't drink grape juice? Too bad, so sad. I know I'm not the only one who has been forced to grab a plate of cheese and crackers and sit in a corner because I don't like the stuff. In recent years, the emergence of wine bars like Formaggio and Vino leveled the playing field and helped educate more casual fans. And now, other types of alcohol are getting a shot at the spotlight. LOCATED ON the third floor of the newly renovated Royal Hawaiian Center, Doraku Sushi presents an indoor-outdoor dining experience overlooking Kalakaua Avenue. Waikiki is the second location for partners Kevin Aoki and Adrian Najara, who opened the original Doraku at South Beach in Florida seven years ago. Aoki got into the business because of his father, Rocky Aoki, who helped bring Japanese culture to the United States via his Benihana teppanyaki restaurants. The elder Aoki also helped instill an appreciation for sake. "My father believes sake is the water from heaven," Kevin Aoki said. "When he first opened Benihana 40 years ago, he would bring cases of sake back to the U.S. and give them to his distributors and friends." Aoki doesn't give away sake, but he does take pride in the steps taken to secure Doraku's supply via various Japanese brewers. More than two dozen types are currently on the menu, including one seasonal sake available nowhere else. Joined by manager Russell Merdjanian, Aoki pours me a cup of Aramasa, a junmai sake (made from rice with at least 30 percent of the grain milled away) that is surprisingly smooth and dry. We pair the 5-ounce masu ($13) with plates of shrimp ($9.25) and vegetable tempura ($7.50). Three specialty cocktails from RumFire. "This is the most premium," Merdjanian says a few minutes later as he pours from a 5-ounce serving ($13) of Tedorigawa's Iki Na Onna daiginjo sake. "You can drink this all night long and not get a hangover!" Roughly translated as "Lady Luck," the Tedorigawa is even smoother than the Aramasa, with an underlying sweetness and none of the bite associated with lower-quality sake. Aoki adds that most of Doraku's sake can be used in cocktails; more than a dozen varieties are on the drink menu, including Doraku Lemonade ($9), Asian Pear Saketini ($9) and Sake Sangria ($9). The restaurant also offers 10- and 16-ounce pours for customers who don't want an entire bottle. The Emperor Sampler ($18) pairs Dewasansan, Arabashiri and Suirakuten sake, while the Samurai Sampler ($12) offers up Okuden Kantsukuri, Hana no Mai and Oka sake. THE FOCUS at RumFire, as the name suggests, is rum. Lots of it. 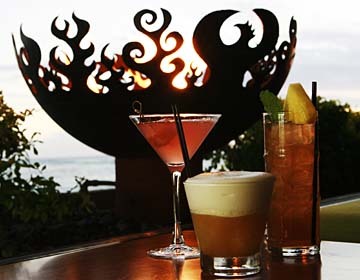 The newest addition to the Sheraton Waikiki, RumFire is housed in the space formerly known as the Esprit Lounge. It underwent major renovations last year, including the addition of oceanside fire pits that provide breathtaking views at sunset. Inside, more than 100 varieties of rum await. Ask for a menu and you'll receive a 15-page book that serves as your international passport. "We're starting to educate people ... (but) it's such an untouched area at this point," explained manager Doreen Nozoe. "But a lot of our rums are priced in the $8 range, so people can start slow, and if they find something that excites their palate, they can move onto our more expensive offerings." 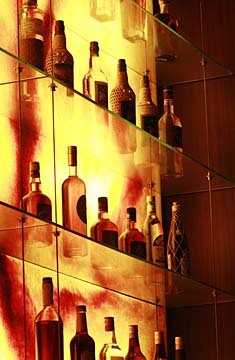 Bottles line the "Rum Tower" at RumFire in the Sheraton Waikiki, above. Tastings are done in groups of three, with each 2-ounce serving poured into what looks like a test tube. Customers pick three kinds of rum, and the overall price reflects the charge for the highest grade chosen. For example, Nozawa and assistant manager Corey Campbell decided to introduce me to Rhum Clément X.O. ($20), Gosling's Black Seal ($8) and Cruzan Single Barrel Estate ($11). According to RumFire's pricing guidelines, the rum they chose should have cost $20 overall. "It's all up to each person's taste," said Campbell. "The ones that are more expensive all have a stronger kick, while the cheaper ones are actually more smooth. Just like wine, it's really up to each person's individual palate." Made from a blend of vintage rums from 1952, 1970 and 1976, the Rhum Clément did have the strongest bite, but it was still plenty sweet thanks to the sugar cane used in distilling. And while I thought I would enjoy the Cruzan Single Barrel more (since I'm a whiskey guy, and this stuff is aged for up to 12 years in used Tennessee whiskey barrels), it turned out my favorite was, in fact, the cheapest. Made from molasses, Gosling's Black Seal balanced a sweetness with the alcoholic undertones you'd expect. Although I was supposed to just sip it, I couldn't help but think how it would taste with a splash of cola. 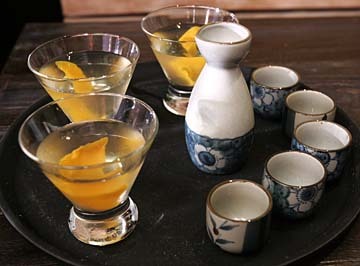 A five-ounce masu from Doraku Sushi sits alongside the restaurant's signature fruit-infused sake. As at Doraku, the staff at RumFire is trained to gauge each guest's interests and make suggestions accordingly. For those who might not want to spend an hour sipping a single shot, Nozawa recommends one of the signature libations developed by mixologists Francesco Lafranconi and Joey Gottesman. The 1944 Mai Tai ($11) is a no-brainer, and it even incorporates the top-shelf Rhum Clément that I sampled. The Tradewinds ($11), a mix of Matusalem Platino Rum with watermelon and lychee liqueurs, has turned into a tourist favorite. Nozawa also recommends the Deconstructed Piña Colada, with ice cubes made from pineapple juice and fresh coconut foam. The most important thing I learned during my pair of sampling sessions is that you shouldn't let yourself perpetuate stereotypes about any one particular kind of alcohol. I learned long ago that only lower-quality sake is served warm, but didn't realize until last week how much better some higher-quality sakes taste until I had a chance to try them. The same goes for rum; after years of Bacardi and Myer's, it was an eye-opening experience to sip some of the best from other regions around the globe. With Doraku and RumFire now a part of the Waikiki landscape, more people have a chance to expand their alcoholic horizons. And judging from the way that wine has been embraced around here, it might not be long before Honolulu residents become some of the best educated sake and rum drinkers worldwide. Barfly appears every last Friday of the month in HiLife. Reach Jason Genegabus at jason@starbulletin.com with suggestions of neighborhood bars to visit.